Meet my little white dress. Unlike LBDs, I don't have 10+ little white dresses. This is the one and only LWD that I own. If it were up to me, I'd have rows and rows of rainbow colored dresses. And although white isn't part of the rainbow, it is an essential color in my closet! I also added my biggest necklace from Nasty Gal, my favorite heels, and an ear cuff. It may be small, but it sure is statement! This is my 3rd ear cuff.... I think I'm addicted. I love your white dress! 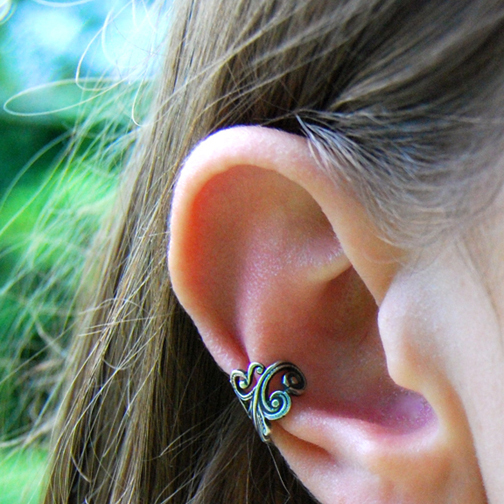 I like all these ear cuffs you've gotten. I'll have to try finding one to test out myself. They add such a cool touch to every outfit. Love your LWD! I can see how it would be hard to style with the ruffle though, yes. I think I'm in need of a LWD for summer too. I am in love with your jacket. The lace and color of it is perfect. Plus you look stunning in the white dress! I love your dress & ear cuff! 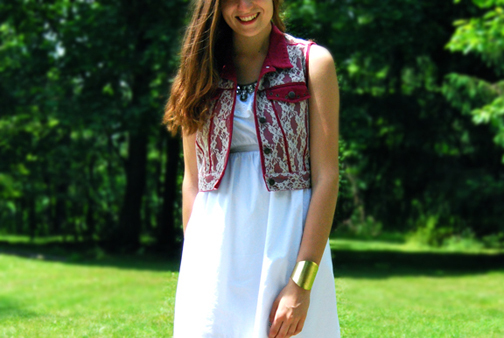 Amazing vest, the red denim with lace looks great! I've been wanting a red denim jacket for forever, so that I can make it look all beat up and sew cool patches onto it. I really need more dresses, too. I have one white one, but it doesn't fit well. And other than that, I have like, 3 dresses, but some I rarely ever wear. I want some quirky ones though! Super cool blog, LOVE IT!